Crescent Town, East Danforth, Gerrard India Bazaar, Leslieville, and Upper Beach since 1972. June 5, storyteller Sally Jaeger and I are participating in the first Ontario Ultimate Block Party from 11 a.m. to 5 p.m. at Toronto’s historic Fort York. From 7,000 to 10,000 children and their families will tour and take part in about 20 play-based learning-activity centres. The activities are for children aged one to 81, with lots of interaction as well as performances. The event is being organized by the Elementary Teachers’ Federation of Ontario with advice from the coalition that founded the successful New York Block Party. What is play-based learning? It is meant to be hands-on, interactive, open ended – about the process not the product – which allows for learning through exploration and play. Sally and I will be hosting Finger Plays – Stories To Take & Tell from 11 a.m. to noon. We plan to introduce families to early stories, finger plays and rhymes so that everyone comes away with something they can retell and play. I will also be giving examples of crafts, ie. simple puppets and props made from recycled materials that will allow parents and teachers to extend the storytelling experience through crafts and dramatic play. Through the years the craft column has featured some ‘story extenders’ and I would like to offer a few of my favourites again. Simple puppets can be created by providing paper lunch bags, paper plates, paper towel rolls, toilet rolls, egg cartons, tissue paper, construction paper and glue – anything from the recycle bin. Read your favourite fairytale – Three Little Pigs, Red Riding Hood, The Gingerbread Man – and let your child have fun making a puppet to go with the story. 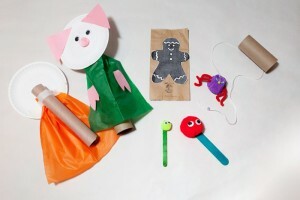 Use a paper lunch bag and make a simple puppet from a story you like. Or, for something more elaborate but fun, gather and tape a rectangle of tissue paper around the top of a paper towel roll. Tape a paper plate to the front, make any animal or character face you like. Hands can be added by tracing and cutting out your child’s hands and glued onto both sides of the tissue paper. I know a few songs and rhymes about fleas and once at a library, a young boy of six gave me a flea he had made, and to this day I still use it! He had glued googly eyes onto a bright pom pom! I glued it onto a popsicle stick to make it easier to see and use. She put it in the tea pot to make a pot of tea. And in came Sally with her shirt hanging out! A really fun and popular nursery song is the Eensy Weensy Spider. Paint one cup of an egg carton. When dry, glue on eyes and a little pom pom nose. Poke pieces of pipe cleaners through sides for spider legs. When finished, thread a length of string through the top of the spider’s body and then through a toilet roll, knot with a bead. Pull the string down and watch the spider go up! And the eensy, weensy spider went up the spout again! It’s great that the importance of play is being recognized once again. Play is a great learning tool and fun! So, if you can, be sure to come down to The Ultimate Block Party and visit Sally and myself at our play centre: Finger Plays – Stories to Take & Tell. Did you enjoy this article? If so, you may consider becoming a Voluntary Subscriber to the Beach Metro Community News and help us continue providing the community with more local content such as this. For over 40 years, our staff have worked hard to be the eyes and ears in your community, inform you of upcoming events, and let you know what and who’s making a difference. We cover the big stories as well as the little things that often matter the most. CLICK HERE to support Beach Metro News.